Finishing third at the conclusion of the 2011-12 NHL regular season and led on the scoresheet by Anze Kopitar, the Los Angeles Kings easily handled Vancouver, St Louis and Phoenix before a Stanley Cup finals showdown with Martin Brodeur and the New Jersey Devils. Winning the first two contests in Newark, the Kings set the single-season consecutive playoff road winning record at ten, with the Devils only able to win a pair in the series. 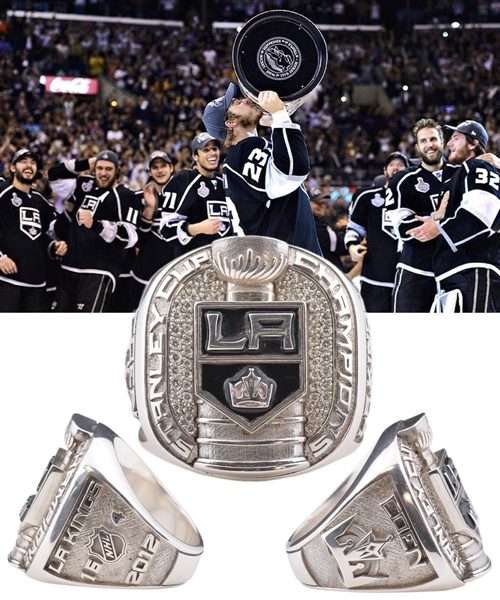 Crowned the 2012 Stanley Cup champions, we have a stunning Los Angeles Kings Stanley Cup championship Tiffany & Co sterling silver and diamond ring that was presented to former locker room attendant Nic Coen. Size 10 ½ and weighty at 61 grams, a Kings black enamel logo sits mounted over a Stanley Cup, centered over the tableau over a sea of real diamonds, encompassed by “Stanley Cup Champions” in raised letters. The right shank has an embossed Kings’ crown with “Coen” above, while the left feature’s an NHL shield logo with their playoff record of “16-4”, with “LA Kings” above and “2012” below. 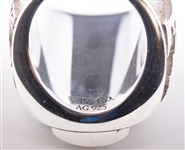 The inner band is also stamped with "T & Co. AG 925". A Classic Auctions LOA will accompany. The ring displays beautifully, with scratches over the outer band and a few small nicks and grooves along edges. The original Tiffany case and outer box will accompany this highly desirable keepsake.